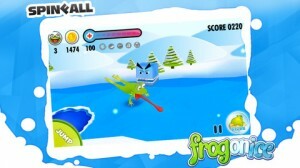 Frog On Ice iPhone Game Review: Hop To It, Players! Frog on Ice is an iPhone game developed by SpinFall. Billed as “a super cool, frog-slinging, side-scrolling adventure game,” Frog on Ice offers fun graphics and gameplay that is as engaging for kids as it is to adult players. 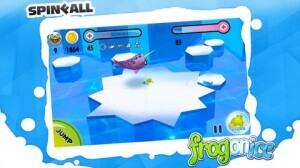 Frog on Ice captures something really magical for me. It’s one of those rare modern games that makes you feel like you’re playing a game from your childhood. It’s a wonderful experience, and I’m not entirely sure how the developers pulled it off. Perhaps its the sound design, which has a bit of a retro feel while still feeling current. Or perhaps the secret is in the graphics, which have a joyful, polygon-like quality that reminds me fondly of the character and environment design found in classic Playstation titles like Crash Bandicoot. This game gives me a warm fuzzy feeling, not just because it’s cute, but because it captures that combination of simple controls and challenging gameplay that all of the classic video game and arcade titles of my youth had in common. The perfectly calibrated controls really couldn’t be simpler to use. Tap the left side of your screen to jump, while you propel and steer yourself forward with your sticky tongue using a right-hand tap. 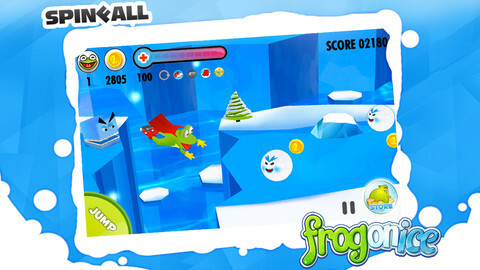 Along the way, you need to avoid icy enemies and pitfalls, while also collecting coins. Frog on Ice has that certain something that all instant classic games have: it’s a hard thing to define or explain, but once you play this game, you’ll know exactly what I mean. 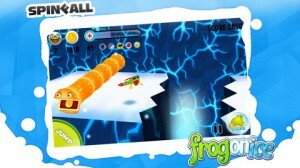 Sorry Frogger: Plop the Frog is my new favorite video game amphibian. 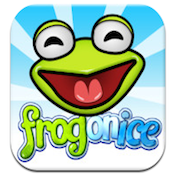 Frog on Iceis compatible with iPhone 3GS, iPhone 4, iPhone 4S, iPhone 5, iPod touch (3rd generation), iPod touch (4th generation), iPod touch (5th generation) and iPad. Requires iOS 4.3 or later. This app is optimized for iPhone 5.